Hey there! 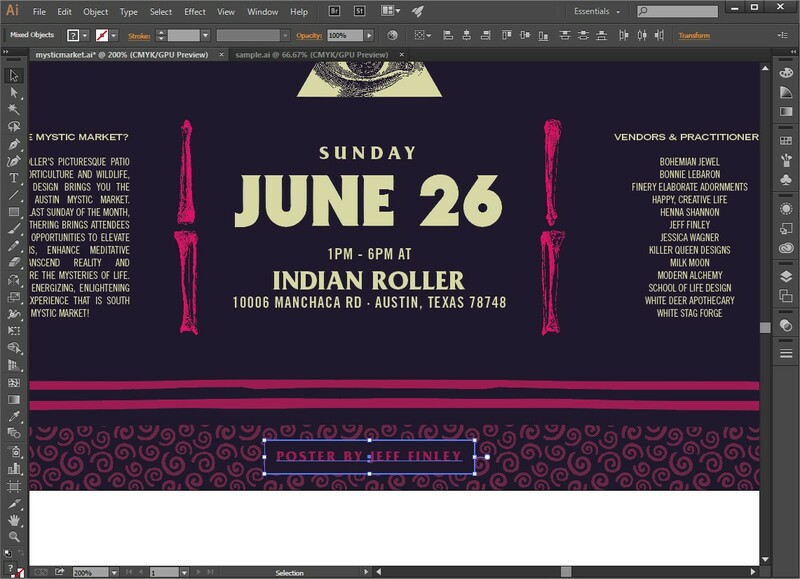 It’s Jeff Finley here to show you how to create this eye catching poster design for an event. 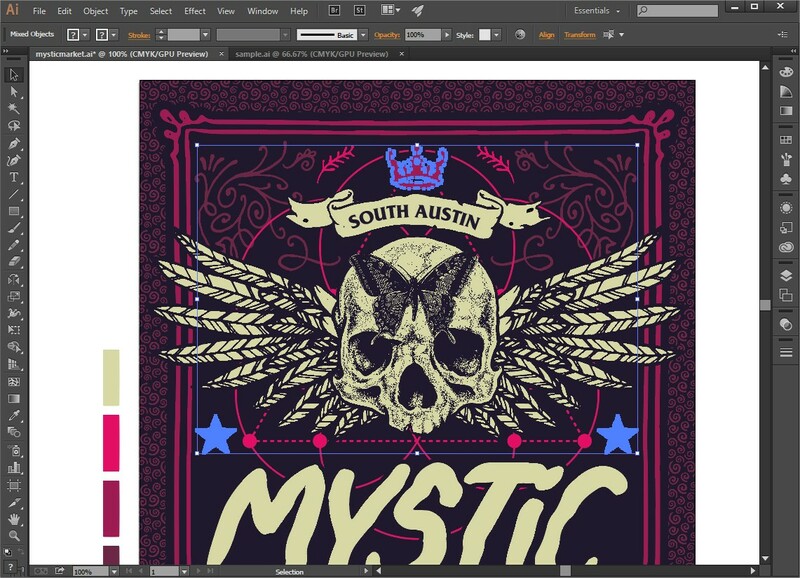 We’ll create our layout by using elements from the new Vector Essentials: 600+ Hand-Drawn Vector Elements. 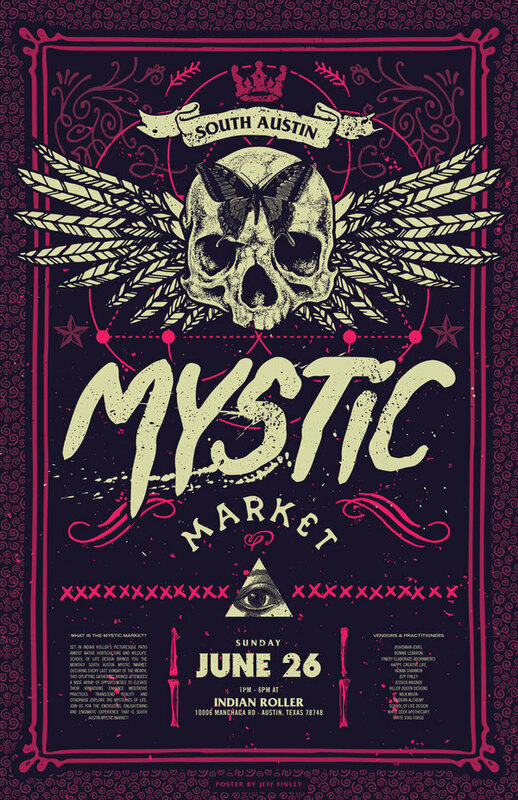 I’ve included a free sample that has all the vector elements I used in this poster. 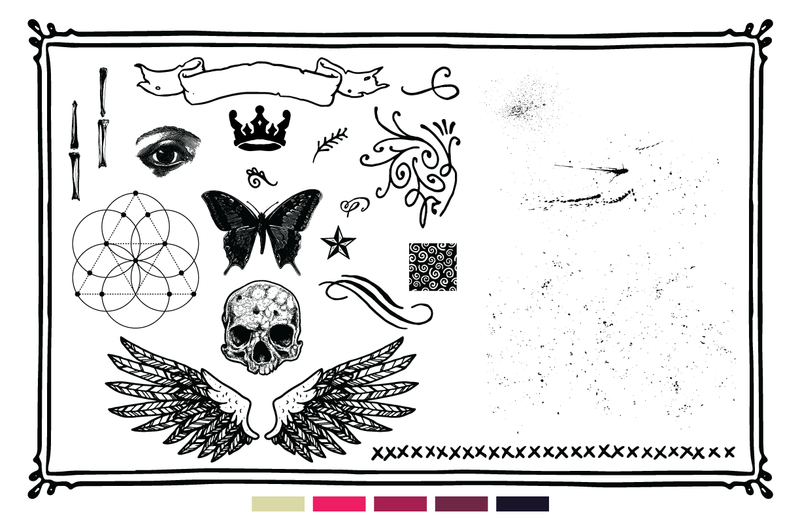 The freebie pack includes everything you see here, notably the skull, wings, decorative flourishes, frames, divider, seamless pattern, butterfly, bones, sacred geometry, nautical star, splatters, and a subtle grunge texture. This freebie pack is just a small sample of the resources available in the Vector Essentials: 600+ Hand-Drawn Vector Elements. There is a whole bunch of good stuff in there that will help your creative projects for years to come. Once you have downloaded it, open the file in Adobe Illustrator. We’ll be returning to this file to grab our elements! Open Illustrator and go to File > New. In the New Document dialog box, enter your file name, “mysticmarket” and choose the size “Tabloid” for a very common poster size. Click OK to create the document. Select the Rectangle Tool (m) and press ENTER. Type in “11 in” for the width and “17 in” for the height and click OK. Use the ALIGN tool to center it both horizontally and vertically on the Artboard. 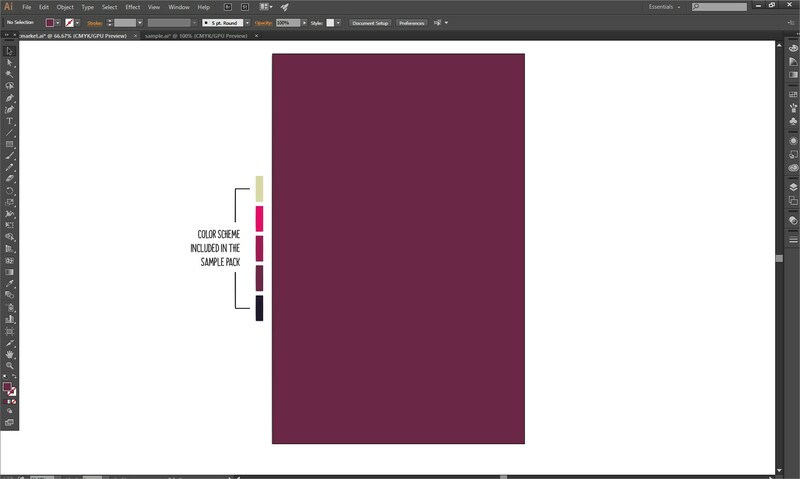 Change the color of the rectangle to a color of your choice, or use the plum color I included in the sample pack by using the Eyedropper Tool (i). Next, we’re going to set up our seamless background and our frame. 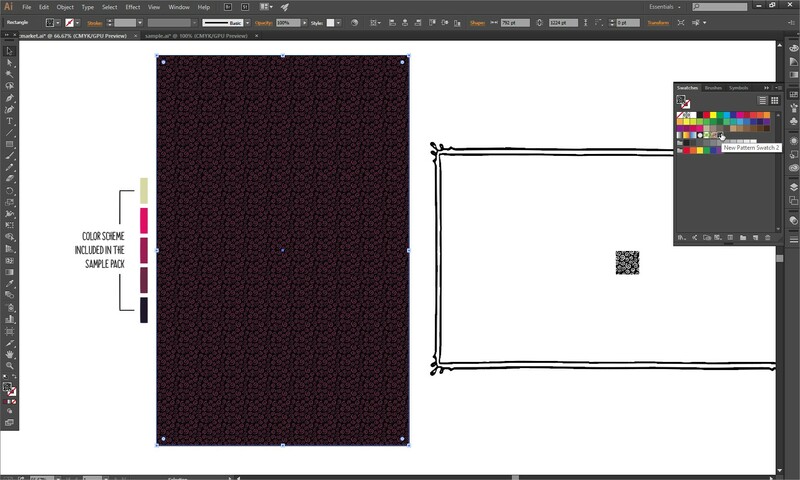 Go into the Sample.ai file and select the seamless pattern tile and the frame. Copy and paste those into your poster document. Once you have pasted the two elements into your main document, we’re going to set up the Seamless Pattern. It’s super easy. Just select the pattern tile and drag it into your swatch panel and it will create a new swatch automatically. Now we have a seamless pattern! Next, select your background image and Copy (Ctrl+C) and Paste in Place (Ctrl+F). Apply the pattern by clicking the new swatch. Voilà! You will see your pattern seamlessly tiled across the entire background. Now let’s change the color a bit to match our color scheme. First, let’s make actual swatches from our color palette. Select all the colored shapes at once, then on click the little menu icon in your swatch window. Click “New Color Group” and click OK. It will take the colors and create a new swatch group out of them. This comes in handy in the next step. Next, select your background with the pattern fill. Then go to Object > Pattern > Edit Pattern. Zoom into the pattern tile and select the black area. Then do Select > Same > Appearance to make sure you get the entire black object selected. We’ll apply our dark purple color swatch to it and then click Done. Yay! Now our background matches our color scheme. Let’s add the frame next. Select the frame and rotate it by 90 degrees holding shift. 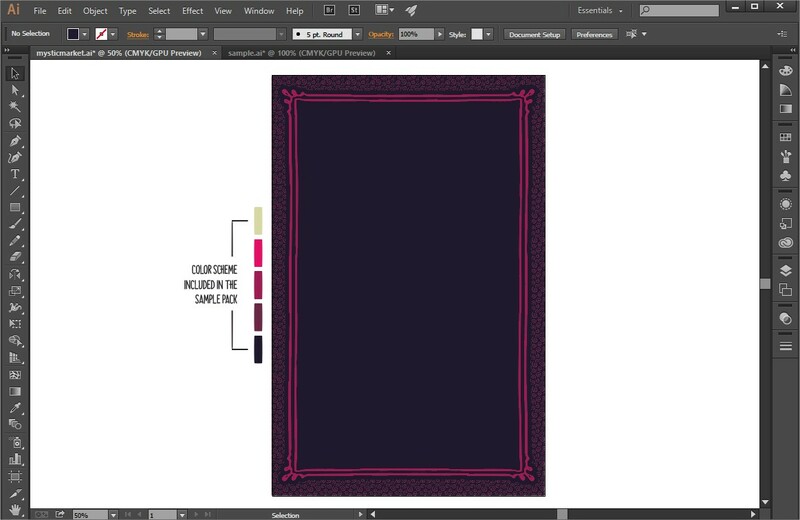 Then use the Align to Artboard tool to center it on our canvas. Change the color to medium purple to match our scheme. After this, we’re going to select the frame and Copy it and Paste in Place again. Right click and “ungroup” the objects. Do this again until you see the “release compound path” option when you right click. Click “release compound path” and then use your Pathfinder tool “Unite” to combine all the shapes into one large block. Give this large block a stroke of 12 pixels and then go to Object > Expand Appearance. Then use the Pathfinder tool “Unite” again to combine all the shapes. Send this shape behind your frame by right clicking, Arrange > Send Backward or pressing Ctrl-[ on your keyboard. Now that we have our background finished, let’s start adding the centrepiece images. 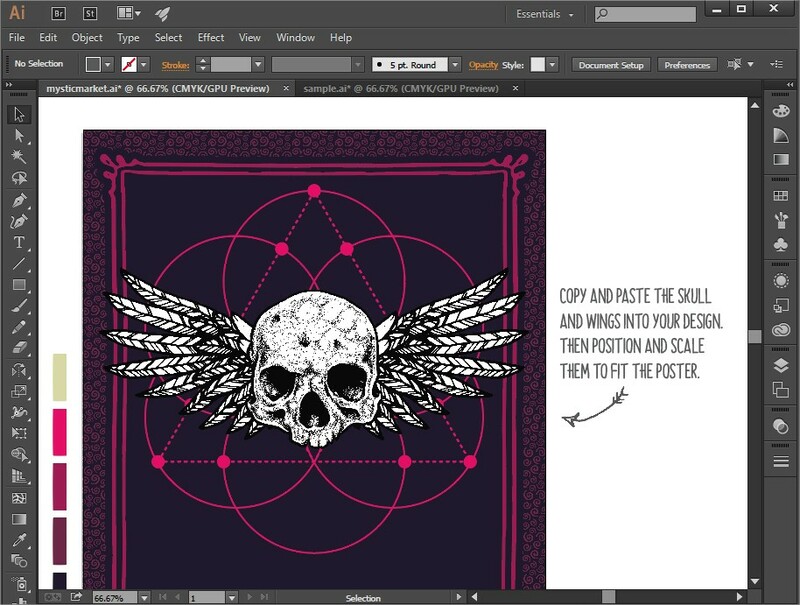 Go back to the free sample vector pack and select the Skull and Wings illustrations. Copy and paste them into your main file. Align them horizontally using the Align Tool and position them toward the top third of the poster. We’re going to leave room for the lettering and type underneath. Resize the wings so they extend just beyond the frame. Let’s add the lettering next. 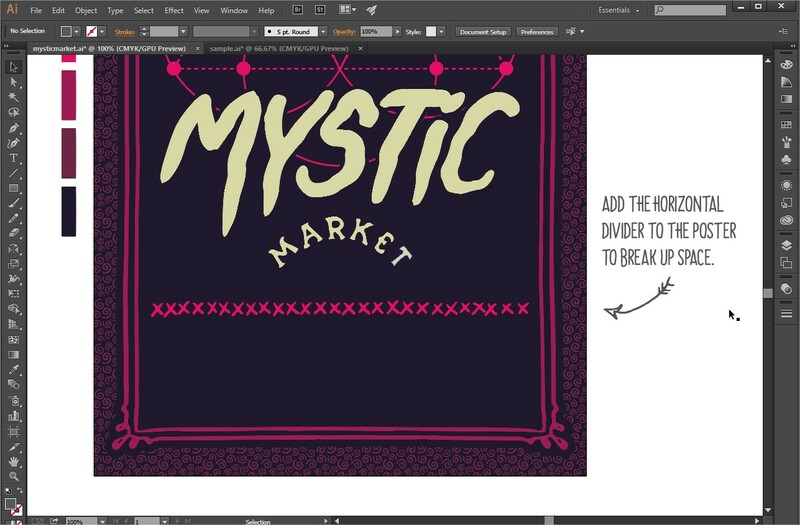 I have already drawn up some cool lettering for the words “Mystic Market” in Photoshop using my Wacom Tablet. I had pressure sensitivity turned on and my brush was simply the default brush set to 100% hardness. Feel free to use your logo or font or perhaps even your own lettering. Next, let’s add the Butterfly to the Skull to give it a more esoteric vibe. Go to the freebie pack, select, copy, and paste the butterfly into your main file. Position it so it is in the center of the skull. Then change the colors like we did with the other images. The blacks should be dark purple and the whites should be cream like before. Also, let’s separate the text from the background a bit more by adding a 6px dark purple stroke set to the Outside. Do you see how the text pops off the background a bit more? Next, we’re going to add the banner. 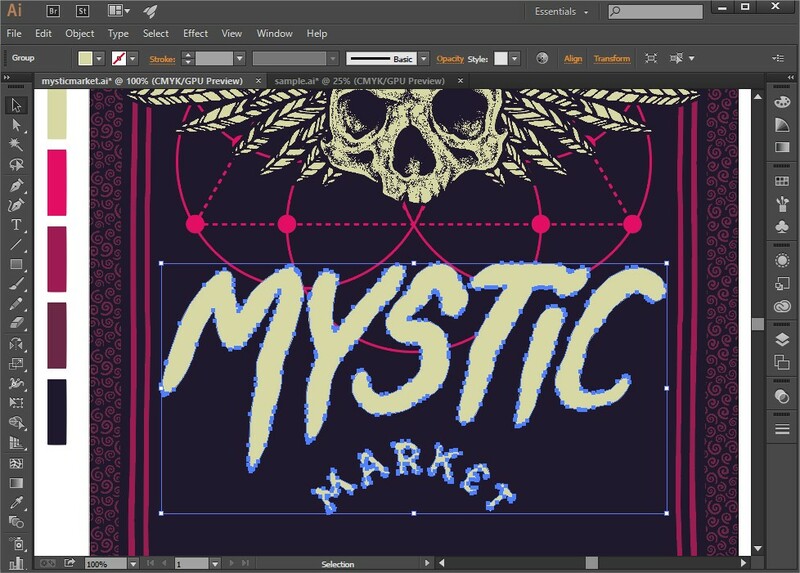 Go to your sampler file, then copy and paste the banner into your main design document. Center it on the artboard using the Align Tool and then position it slightly above the top of the skull. Change the white to cream and the black to dark purple so it matches the rest of the design. To add some custom text on the banner, first we’ll create a path for it to follow. 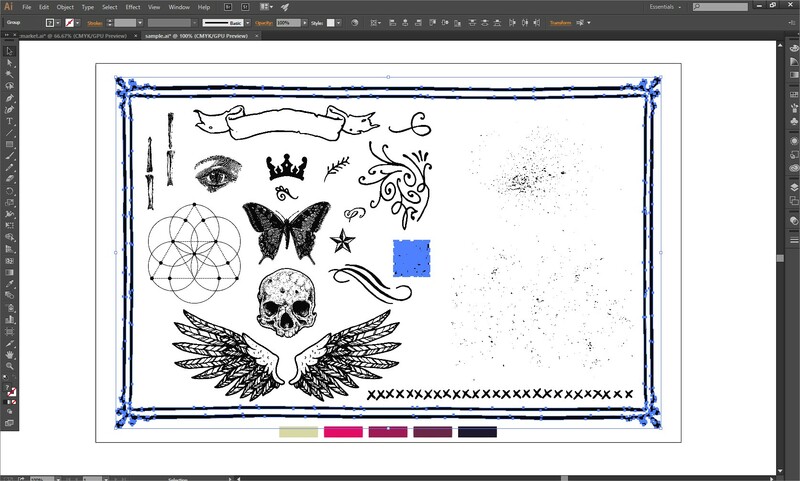 Using the pen tool, click in the lower left corner of the banner and then add a point to the lower right. Use bezier curves to get a nice curve that follows the shape of the banner. Then use the Type on a Path tool and click on your new path to start typing your text. 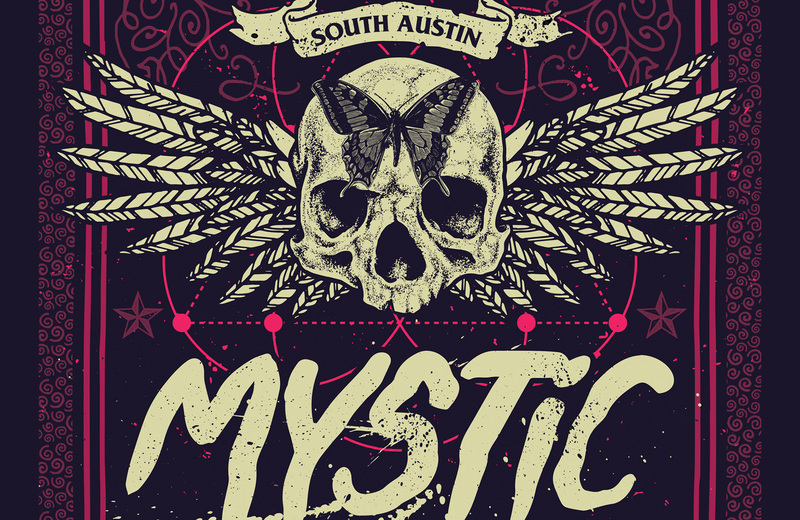 I typed the words “South Austin” and then adjusted my font size and centering. Now we’re going to create the All Seeing Eye. Start by selecting the Polygon Tool and clicking once anywhere on your canvas to bring up the polygon dialog box. Choose a radius of 60pts, and 3 sides to create a triangle. Align the triangle horizontally using the Align Tool and position it on top of the horizontal divider. Create a square a little bit bigger than the triangle. Give it a cream color and then center and position it directly behind the triangle either by pressing Ctrl+[ or right clicking > arrange > send backward. Then hold shift and select your triangle and right click > make clipping mask. Double click on the triangle to enter the clipping mask. 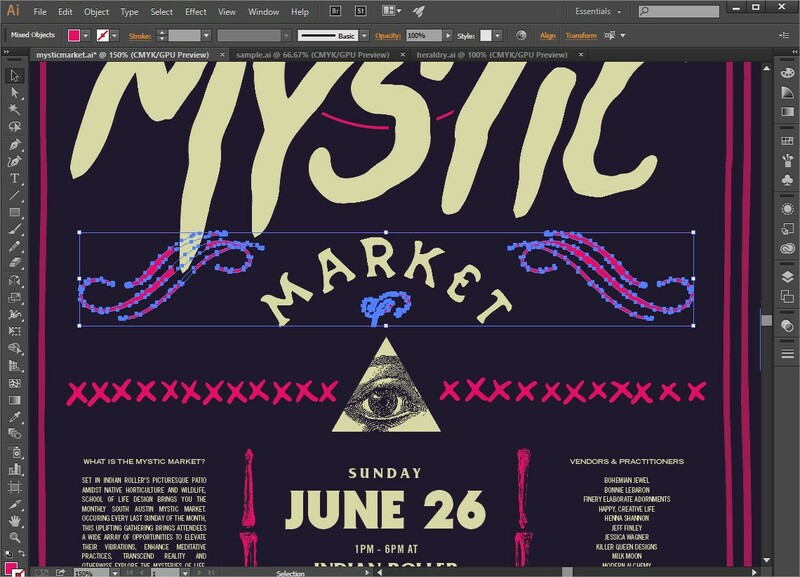 Go back to your sampler file and copy and paste the Eye Illustration into your main file. 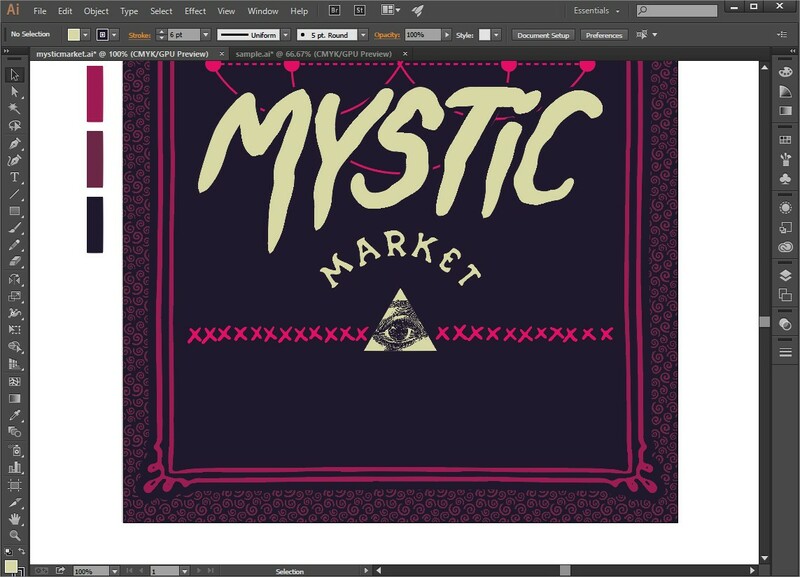 You are already inside the clipping mask so just position the eye inside the triangle and give it a dark purple color. Double click anywhere outside to exit your clipping mask. You’ll see that the edges of the eye illustration are clipped and held within the triangle shape. To give the triangle some space, let’s delete some of those Xs in the divider line so they aren’t so close to the triangle. Double-click the divider line to enter its group, and delete the Xs directly behind the triangle. This will do the trick. Step 3: Add the Footer Text! Before we add any text, let’s separate the lower half of the poster into three sections. Use the four different bone illustrations in the sampler file and position them like shown below. Stack two on top of each other to create a vertical divider. Give them a hot pink color and use the align tools to keep them even. Once you have them visually where you want them, select them all and group them. 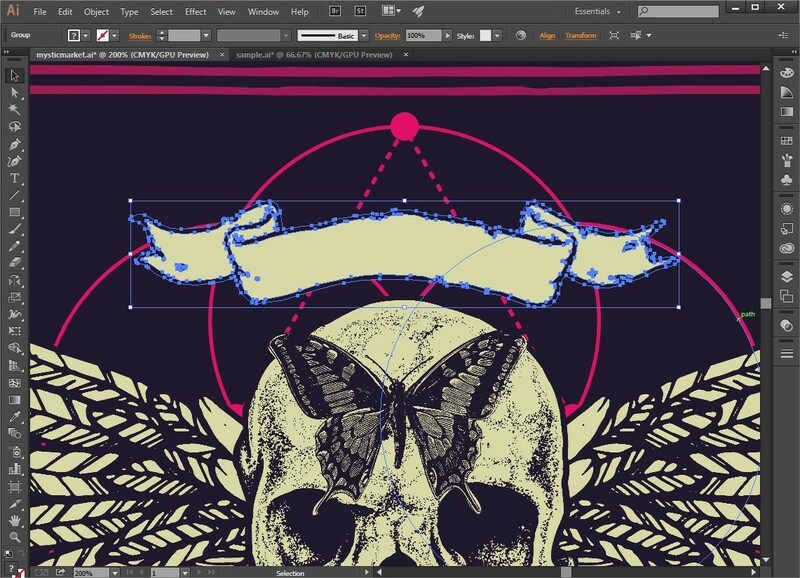 Then use the Align Tool to center them horizontally on the Artboard just to make sure. Now let’s add the type. Use the Type Tool and drag a text box on the left third column. This is where I put the description of the event. Since I already had it written, I copied and pasted it into my text box. 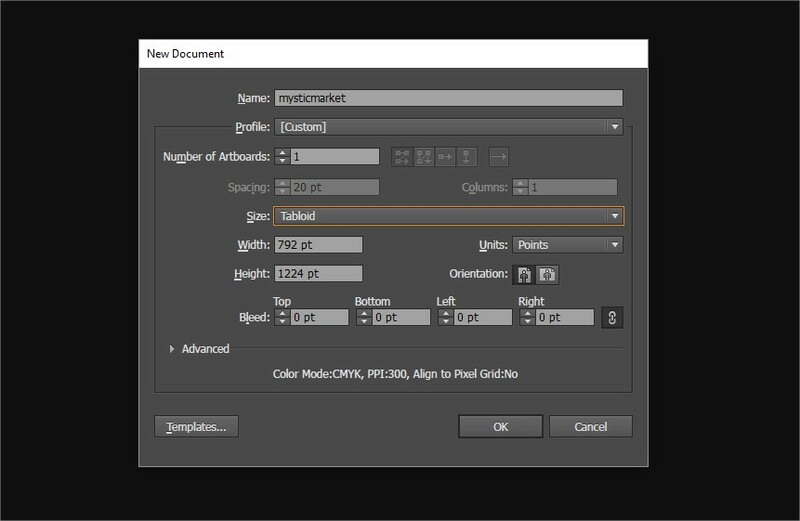 Change the text to the cream color and choose your fonts. In my case I used Trade Gothic Bold Extended for the header and Trade Gothic Condensed for the body text. I set my paragraph to centered justify and adjusted my font size and spacing to what looked good to me. Then once I was satisfied, I duplicated the text box by Alt-Dragging the text to the far right column. 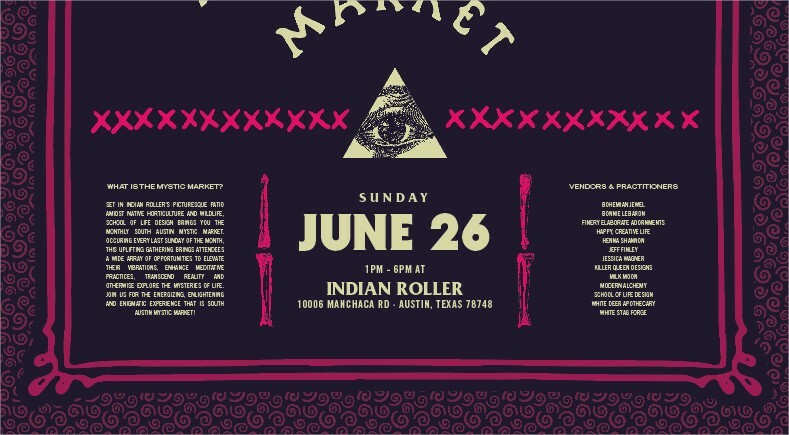 This is where I put the lineup of vendors that will be appearing at the event. I used the same type settings as my other text so it all matches and looks congruent. In the center, you’re going to put the date, time, and location of the event. I used some of the same fonts here, but used ITC Serif Gothic Ultra Bold for the date to make it really stand out. I also introduced another font Friz Quadrata to spice things up. I adjusted the letter spacing and sizes to create a nice visual hierarchy. The date stands out the most as well as the name of the venue. Time to spice things up. Go into your free sampler and copy the large corner flourish item and paste it into your main document. Position it into the top right hand corner and give it a medium shade of purple. Go back to the sampler and copy the small branch and ornaments. Paste those into your design and position them around the corner piece in a way that looks pleasing to you. Once you are happy with the layout, select the flourish and your ornaments and group them. Alt-Drag to the left to copy your piece to the other corner. Right click > Transform > Reflect and choose the vertical axis to flip it horizontally. Move it into place you find it works best in. One last step is to select both groups and send them backwards by pressing Ctrl+[ repeatedly until it drops into the layer just above the background and underneath the geometrical image. Go ahead and find the crown in your free sampler and copy and paste it into your document. Position it just above the banner and color it the same shade as the border. Give it a 6px stroke around the outside that is the same color as the background (dark purple). Then find the nautical star in your sampler and copy and paste that into your document. Position it in the empty space between the wing and the lettering. Then Alt-Drag it to the other side. Select both of them and press Ctrl+G to group them. 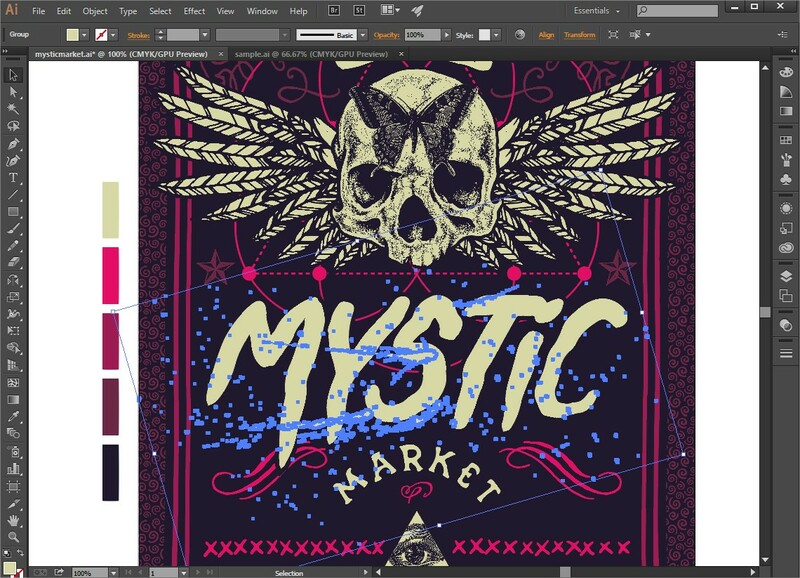 Use the Align Tool to align the group of two stars to the Artboard to make sure it’s symmetrical. Color them the same shade as your flourishes in the upper corners. One more piece of text to add. That is the poster artist credit. In my case, I created a simple rectangle with text in it and positioned it towards the bottom center of the poster. Time to dirty the poster up slightly. First, let’s add the splatter graphic from the sampler. Copy and paste it into your design and position it underneath the lettering. We want it to look like the letters themselves have some action going on. Color the splatters the same as your letters. After you are satisfied with your splatter effect (feel free to add more or play around), we’ll add some subtle grunge to finish it off. Go back to your sampler and grab one of the subtle grunge textures. Just copy and paste it into your design. The first one will add some random organic noise to the background behind the footer. Paste it in, give it the same hot pink color as you did with the other elements. Press Ctrl+[ to send it backwards repeatedly until it is the layer above your background and behind all of your type. For good measure, Alt-Drag your subtle grunge texture to the top of your poster. Rotate it 180 degrees so it’s not an exact duplicate and any repetition will be harder to spot, yet the consistency will remain. This will give the entire poster a subtle grunge effect. Now we’re going to add some subtle distressing. This is done by adding in a smaller subtle grunge texture that is the same color as the background. In this case, a dark purple. Go ahead and grab the smaller grunge texture from the sampler and copy and paste it into your design. Change the color to dark purple and position it over the top of any element you want to “distress” or beat up. A good suggestion is the lettering and the other cream-coloured elements. Feel free to copy and paste more of these around, rotating the grunge or mirroring it so it doesn’t repeat too much. Just do what looks good to you. After applying the subtle grunge, that’s it! We have our final image! We’d love to see your designs on our Facebook page. And there’s still time to check out Vector Essentials: 600+ Hand-Drawn Vector Elements to add a vast collection of incredible vectors to your design library. Thank you for the Freebies and the tutorial! I learned from it wich is always perfect! I was not sure how to actually do some of this stuff, so Thank you very much. Thank you so much for your lovely comment, it really means the world to us to know that you are getting some great usage out of your tutorials and freebies 🙂 If you ever have any questions or if there is ever anything I could assist you with please do get in touch. I’m always happy to help! Fantastic tutorial! Learned a few small tricks and was able to follow along and create a poster for a rock show using most the elements! Thank you so much for your kind words, Mandy! 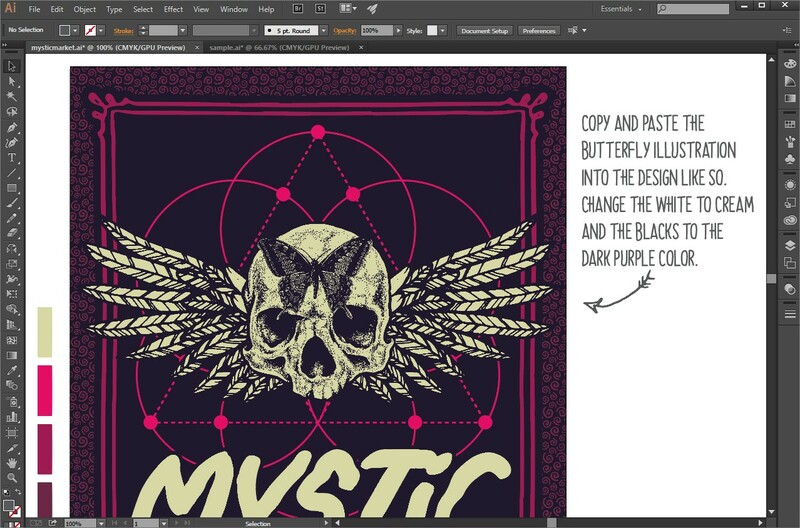 We’re so pleased you enjoyed this tutorial and it’s great to hear you’ve picked up a few tips & tricks for your rock show’s poster design! This is absolutely the perfect tutorial. It has the files, it’s easy explained and even the images are gifs. I love it. Thank you for sharing it. Very interesting. I am pretty new to Illustrator so it is always a challenge for me to follow along and get the desired result. I came close but my colours in the freebies, using the cream and dark purple, look very dark compared to the example given. Do you have any tips on getting this done properly? Using the selection, Same, Fill Colour or Stroke Colour is a very nice way to colour the vector graphics and one I didn’t know existed. I’d like to get it right. My pictures look to have at least twice as much of the dark purple as the example poster. Thank you for the tutorial. Even though mine isn’t perfect I learned a lot from it and appreciate the effort that went into writing it. 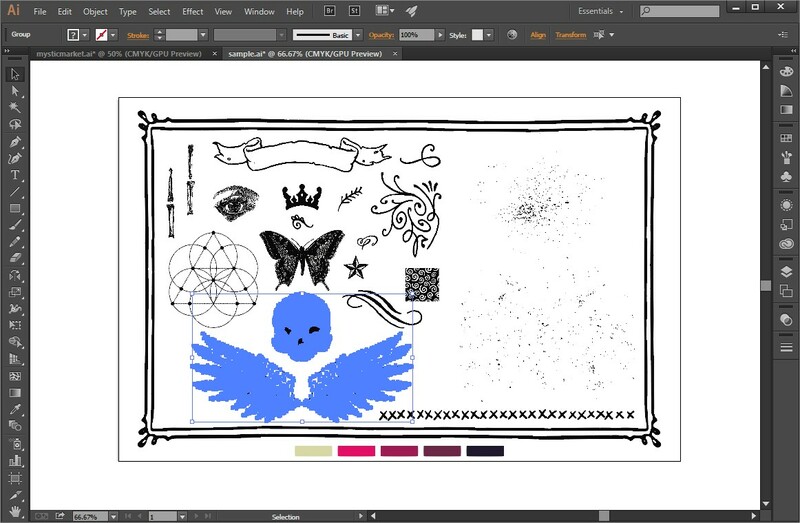 Thank you so much for getting in touch – it’s great to hear that this tutorial has helped you learn some new tricks in Illustrator 🙂 I am really sorry to hear that the colours are not matching up for you but I believe that the lovely SJ is emailing you about at the moment to investigate this further for you. Please do keep me updated and if there is ever anything I could assist you with please do get in touch. I’m always happy to help! This was a fun one! Appreciated the more casual structure of this tutorial. Awesome sauce Jeff, per usual. Thanks so much- I am really glad you liked it! Thanks so much for your comment- I so happy that you liked both the tutorial and freebie! Viel zu schnell, nicht möglich den einzelnen Schritten zu folgen. Schade! We are so pleased you like this one 🙂 I hope you enjoy the freebie! I really like the gifs, especially the last one where we can see the whole project coming together step by step. I am really glad you liked this one and that it has worked well for you- I just love to see a creation come together! Thank you for taking the time to get in touch Ulrike, we really appreciate it. Thanks for the freebies and the tuto!!!!!! You are so welcome, we really hope that you get loads of use out of them both!